Lizards are a common sighting in the Baldwin Hills, scurrying across pathways and basking in the sun. But one lizard in particular has been particularly elusive until now. 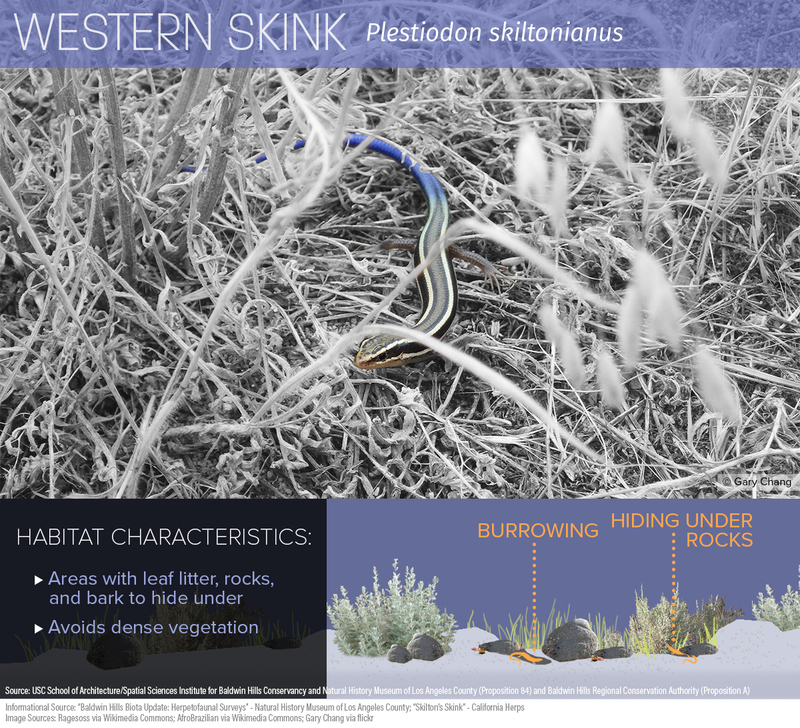 In a 2014-2015 survey of the Baldwin Hills, researchers discovered the Western Skink, a smooth, striped lizard that has never before been recorded in this area. 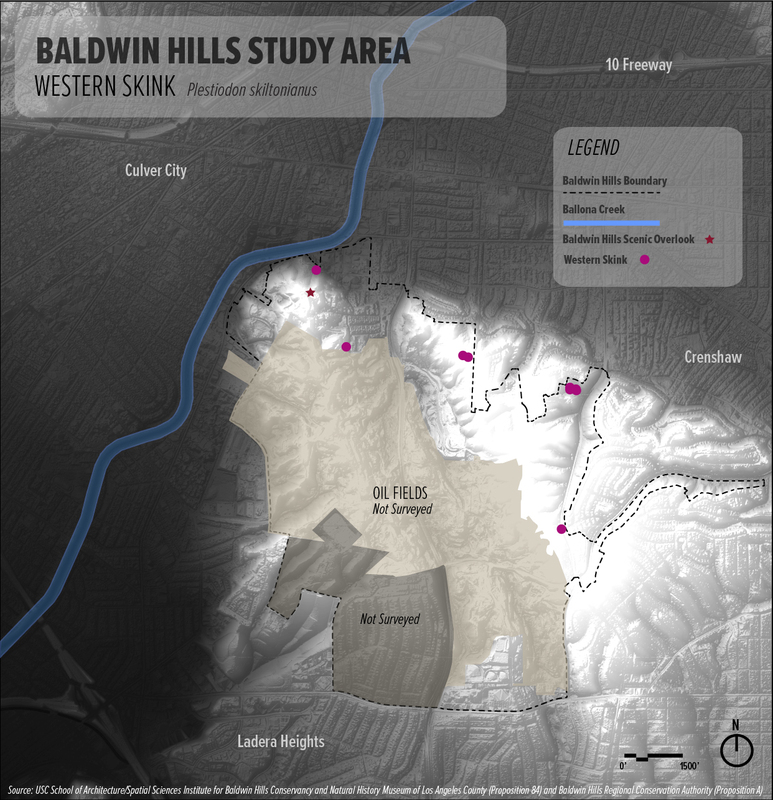 This discovery of what seems to be an isolated population living in the Baldwin Hills demonstrates the ecological significance of these hills and its potential as a refuge for wildlife in Los Angeles. 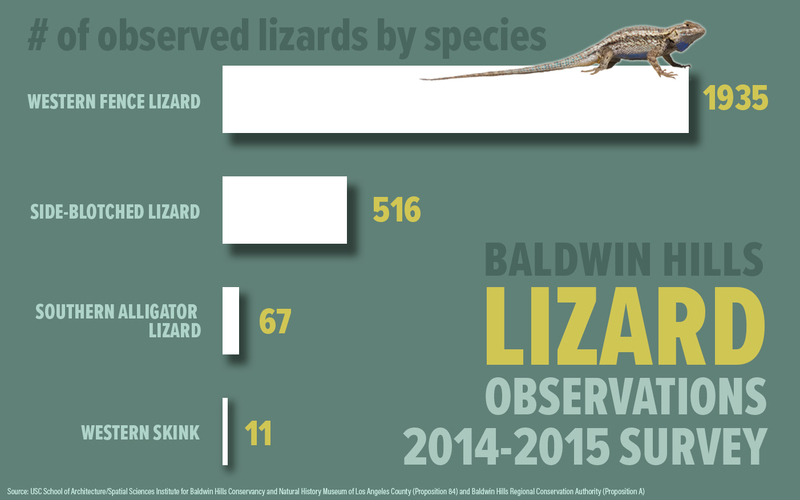 During the most recent survey of reptiles in the Baldwin Hills, researchers documented 11 species, of which 4 were lizards. Related to snakes, lizards also shed their skins as they grow, which you can sometimes spot among the vegetation in the parks. 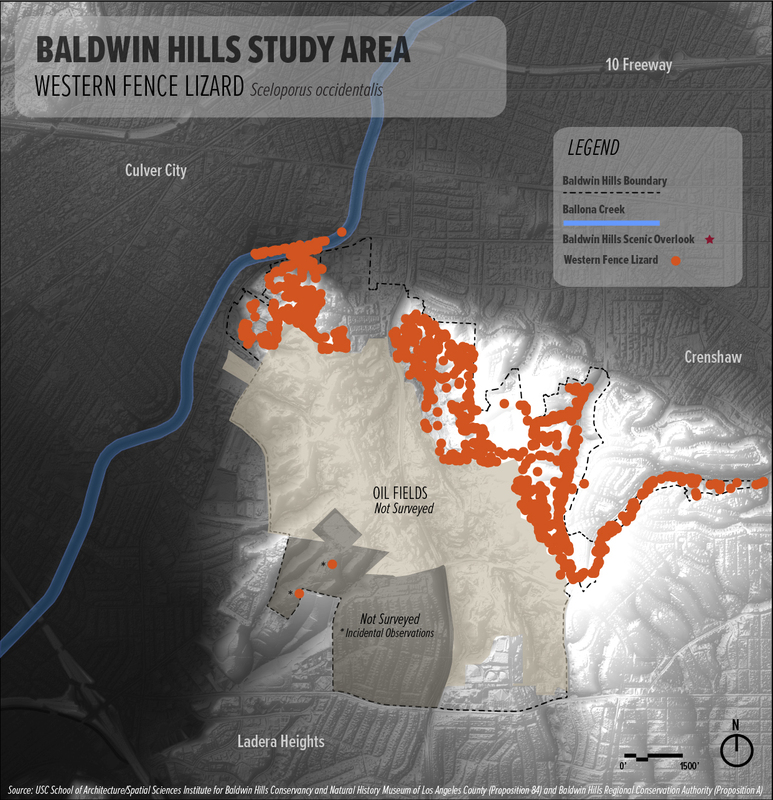 Because of a lack of habitat connection between the Baldwin Hills and the Ballona wetlands area, it appears that there is little movement or gene flow across these areas, making the Baldwin Hills a genetically isolated island for the remaining lizard species that are not tolerant of urban habitats. The Western Skink, an exciting discovery for the Baldwin Hills, is typically not found in California valleys such as the San Fernando Valley or LA basin. Populations do exist however in hilly areas such as the Palos Verdes Peninsula. This small, secretive lizard was recorded 11 times in the Baldwin Hills survey in 2014-2015 in Kenneth Hahn State Recreation Area and around the Scenic Overlook. Since there have been no documentations of the Western Skink in the Ballona region or in the surrounding urban area, it appears this population is genetically isolated from others in the region. 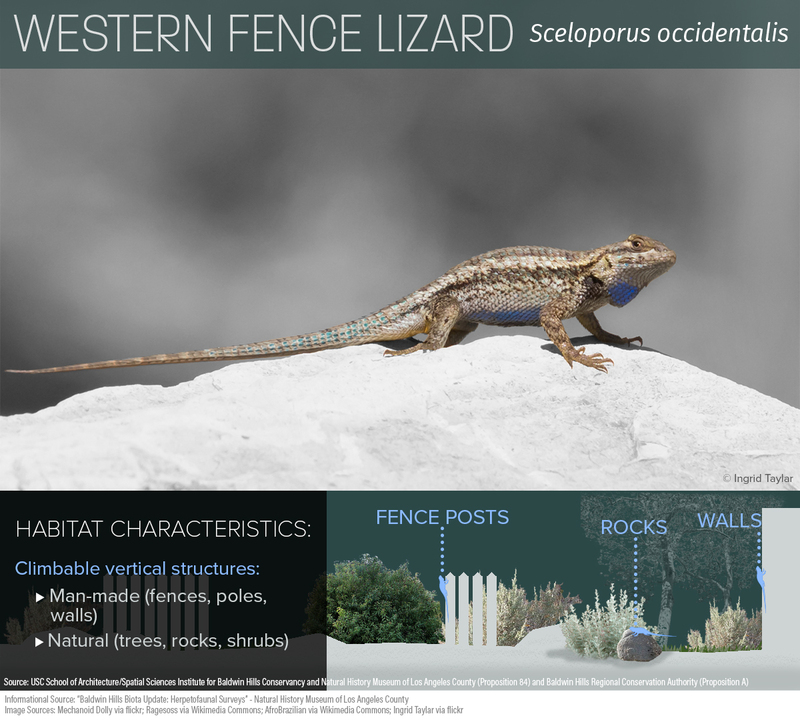 The Western Fence Lizard is the most commonly observed lizard in this area. From the top they appear to blend into their surroundings, marked with tan and black coloring. But their bellies reveal a bright blue patch, making them easily identifiable. It is found in all types of vegetation but particularly in areas with vertical structures for climbing, whether manmade or natural. The Western Fence Lizard can be found all throughout the parks sunning themselves on rocks and fences. 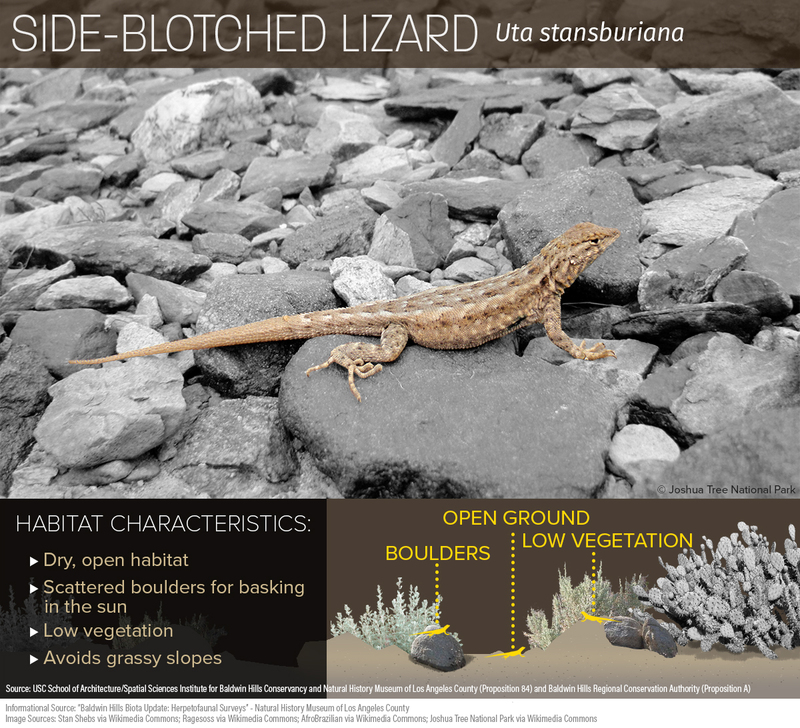 As its name suggests, the Side-blotched lizard can be identified by the dark blotch that marks its side. Another very common species in the Baldwin Hills, this lizard prefers open areas with low vegetation and rocks. You won’t typically find it in more densely vegetation areas or heavy grass slopes. Because of these habitat preferences, the Side-blotched lizard was found in the more open areas of Kenneth Hahn State Recreation Area and the Baldwin Hills Scenic Overlook. 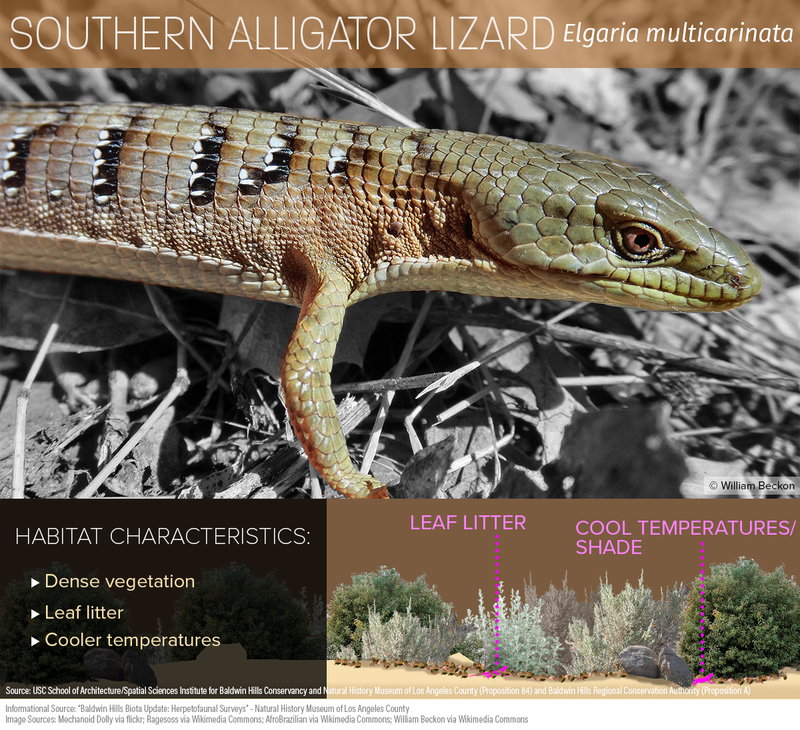 The Southern Alligator Lizard is one of the most widespread urban dwelling lizard based on observations reported by citizens in the Los Angeles basin. In the Baldwin Hills it was spotted in most places, usually in cooler, densely vegetated areas. Unlike the other lizards in the Baldwin Hills, the Southern Alligator lizard usually won’t be found basking in the sun, making it more of a challenge to spot. Though the reptile surveys have not observed this lizard as frequently as the Western Fence or Side-blotched, the more secretive Southern Alligator lizard is likely more common than is documented. For a complete checklist of lizards recorded in the Baldwin Hills, check out our reptiles and amphibians guide on iNaturalist.